We are pleased to invite you to the book launch of "Oferta pública/Public Tender" by Rita McBride. This publication was recently completed in conjunction with Rita McBride’s exhibition at the MACBA Museum of Contemporary Art, Barcelona. The exhibition was a survey of major works, curated by Bartomeu Marí. The publication includes a text by Luis Fernändez-Galiano offering observations on public space, a text by Mark Wigley on the mitigating role of museum walls, and a photographic essay by Anne Pöhlmann, entitled "Thick Powder/White Cubes". In the photographic sequence, the museum is shown in various states of preparedness over the year leading up to the exhibition "Public Tender". 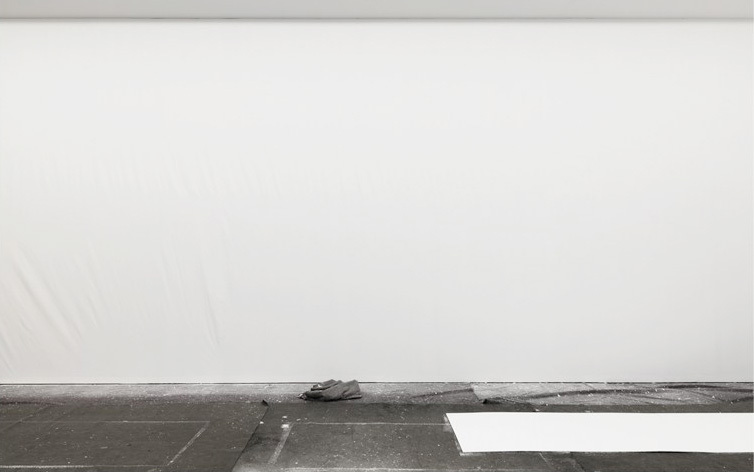 It reveals the empty moment after the last exhibition is removed, and the anticipatory moments when it is about to receive new artworks and just before opening again to the public. This photographic sequence ends with a documentation of the exhibition as installed on the top floor of the Richard Meier building. The galleries on this level have not only been filled with McBride’s works from over two decades, but have also been excavated by her. Working like an archaeologist, she removed the layers of temporary construction that had accumulated over the years. The excavation exposed the skylights that had been blocked since the 1990s, removed longstanding temporary walls, and uncovered long-lost architectural elements. In this process, McBride used the anatomy of the building as if it were itself a sculptural material. A special artist edition by Rita McBride and Anne Pöhlmann will be presented at the book launch. Rita McBride (born 1960 in Des Moines, Iowa) is artist and the new vice-chancellor of the Kunstakademie in Dusseldorf. Anne Pöhlmann (born 1978 in Dresden) is artist and lives and works in Dusseldorf.